The first thing visitors see when leaving the Cape Town International airport after arriving in Cape Town are the squatter camps. The huts built by the squatters line the N2 highway into town are an eyesore and must leave a lasting impression on new arrivals. The shacks are usually built of wood, iron or plastic on any small piece of open ground that can be found and sometimes so close to rivers that when it rains they are flooded and washed away. There is absolutely no planning and when a fire breaks out as often happens hundreds of shacks are burnt down and people lose all their possessions and sometimes their lives. The shack dwellers live under awful conditions with whole families living in one small room. Adults have no privacy and have to share the one or two beds that can fit into the shacks with their children and any other persons who happen along. Those who don't fit into the bed sleep on the floor. Toilet facilities in shacks are non existent and people have to make their way to toilets that have been built on the outskirts of the settlements to use one. 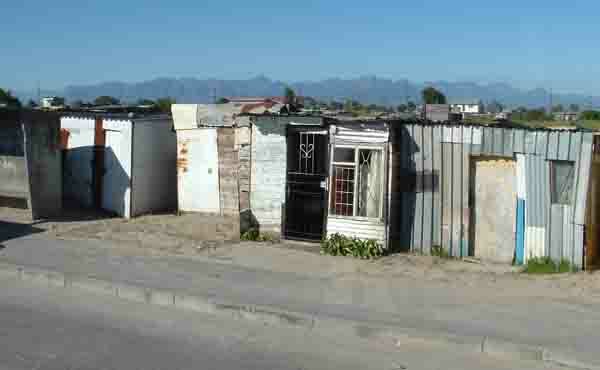 Shacks have no running water and people have to walk long distances in certain instances to get some. Water is free at taps provided by the authorities. What visitors to Cape Town and even some of the locals don't know is that what they are seeing along the highways is not what the entire township looks like. 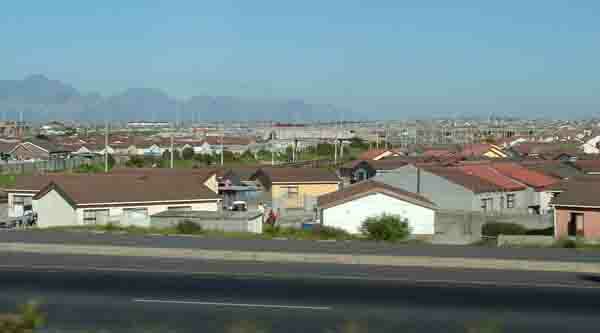 There appears to be three or four levels of recognised housing in the townships. In the centre is the formal township where roads are laid out and brick housing exists for those who can afford it. These houses have one or two bedrooms and modern facilities such as you will find in the so called white areas. A second type of house is being built at present for those people without houses. They are built of brick or cement blocks and are a basic unit with one room and very few other amenities. Most of them are linked to the electricity grid and may have running water. The third type of housing is the semi permanent shacks which have been around for a long time and have been audited by the authorities, given street numbers and have electricity in many instances. The shacks seen from the highways are those of squatters who are not supposed to be there. If they were removed as is being done in Zimbabwe at present many thousands of people would be left homeless. Over the past few years Cape Town has become the number one city in Africa and as such is recognised as the place where people have the best chance of getting work. This unfortunately attracts 50,000 new jobseekers to Cape Town every month. Authorities are doing their best to house all the people arriving in Cape Town but it is just about an impossible task because as soon as someone is placed in a formal house some one else moves into the shack that he/she has just vacated. Another interesting observation is that the centre of any township is its taxi rank. It is there where people gather each day to travel to and from work and it is there where money enters the township from outside areas. 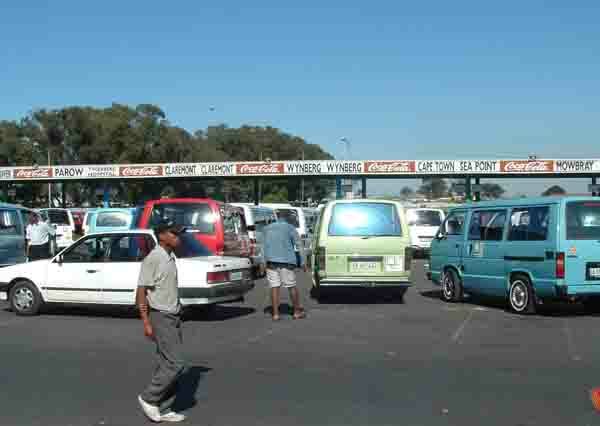 A visit to a taxi rank will be an eye opener for any visitor just as it was for me. It is quite unbelievable what actually happens around it. 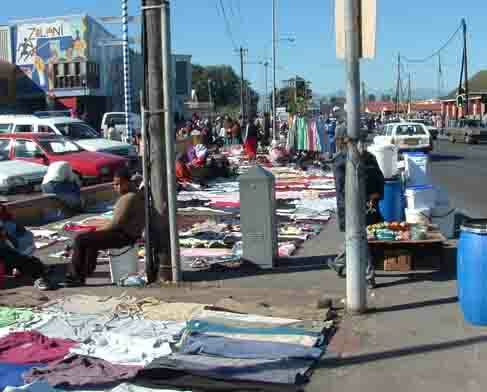 Merchants selling everything from a needle to an anchor trade informally in close vicinity to the taxi rank. The meat market is really rough and ready and a westerner with a sqeamish stomach will be appalled at what goes on. In some instances sheep and cows are slaughtered in the streets and cut up into meat. 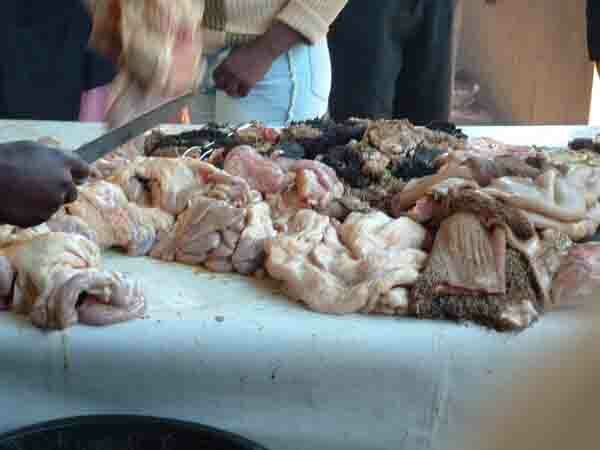 The traders then sell off different parts to other traders who specialise in meat or tripe or some part of the animal. Sheep heads are very popular and driving around the townships you will see many merchants displaying them for sale. The markets also sell clothes, water bottles to store water and even used tyres amongst other things. Many of these wares are spread out on the pavements for people to see. 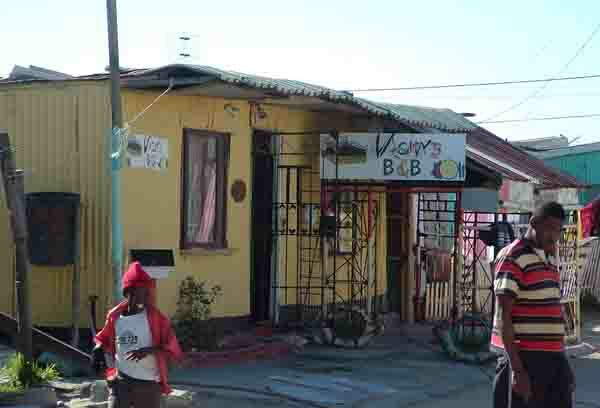 In amongst some of the formal shacks you will find places such as Vickis Bed and Breakfast where African entrepreneurs are climbing onto the tourist bandwagon and offering accommodation for visitors to Cape Town to spend a night in the townships. In the above example another entrepreneur has opened a shebeen more or less opposite the B&B and offers evening entertainment for visitors to Vickis. The economy of the townships is very fragile and if any large organisation were to move into any of them and open a supermarket the locals would lose their livelihoods and many of them would starve. Visiting a township always raises the question - Is it safe? Townships are places where people live and want to do so peacefully. Ninety eight percent of township dwellers are peaceful but unfortunately as in any part of the world there is always a criminal and not so pleasant element present. Your safety depends on whether this element is allowed to operate in the area where you are visiting. By utilising companies who specialise in township tours your chances of meeting up with the criminal elements is reduced as they will not put clients at risk and get a bad name in the process. My advice is to use the tour guides and companies who know the area. These days a visit to a township is on most travellers itineraries and can be quite an eye opener for the uninformed.